Congratulations to "Debbie O", the winner in Sandy's giveaway. Thank you to all who participated! Hi, I’m Sandy Vaile, the author of Inheriting Fear. I’m a motorbike-riding daredevil who isn’t satisfied with a story unless there’s a courageous heroine and a dead body. This story is about overcoming adversity through sheer determination, and learning to trust someone enough to realise you don’t have to do everything yourself. I’m a great believer in ‘nothing worthwhile in life comes easy’. There aren’t many people who haven’t experienced the death of a loved one, illness, uncertainty or abuse. The degrees vary, but we can all sympathise with those situations and identify with the difficulties people going through them have to endure. My favourite heroines are independent women who aren’t afraid to stand out in a crowd. Mya Jensen from ‘Inheriting Fear’ was a handful from the moment she entered my imagination. I had to dig deep and draw on some personally challenging times to take her back story from bland to frightening. All of my characters are fictitious, so in the book you won’t see people I know, or exactly the same situations, but I recalled the feelings of suffering and willpower I had witnessed and funneled those into the story. Some of the personal experiences I reflected on were the affects of alcoholism on families and the death of a loved one. Alcoholism — and other addictions — drain resources and emotions. Family members often need to employ gargantuan amounts of determination to try to help the addicted person, ending up in a circle of destruction. Sometimes the reserves of love and compassion are depleted, leaving behind feelings of resentment and loss. When a situation is out of your control, these powerful emotions may have no resolution. In Mya’s case, her father’s abuse and self-destruction tore her family apart. It would have been easy for her to make the wrong choices about her future, but she crawled from the gutter with her sole focus the well-being of her disabled mother. That took guts and hard work, something I admire. Losing a loved one is difficult at any time, but add to it feelings of resentment and the grief is compounded. Everything Mya had hoped for and wanted in return is lost… Having experienced loss myself, this was another part of my life that filled the well of difficult emotions I needed to drain when creating this story. I don’t like to think of it as exploiting my personal life, but more like channeling the struggles that people face every day. Loss — and not just from death — leaves a permanent imprint on your heart. My characters are scarred individuals — as real people are — and it takes determination for them to overcome the evil hunting them. Chef Mya Jensen’s plate is already full. She has her job, motorbike, kickboxing, and is the guardian of her disabled mother. She doesn’t need a man in her life, especially her cocky new neighbour, Detective Luca Patterson, linking her to his latest investigation. A sizzling interlude with the hot detective puts Mya’s desires and goals at odds, especially while she’s receiving menacing threats by someone who has made it clear they’re willing to follow through. Will this independent woman try to fight her way out of this one, or finally open her heart? You can find Sandy Vaile on Facebook and Twitter. If you want to be the first to find out about new releases and get behind the scenes gossip, sign up for my newsletter: website. 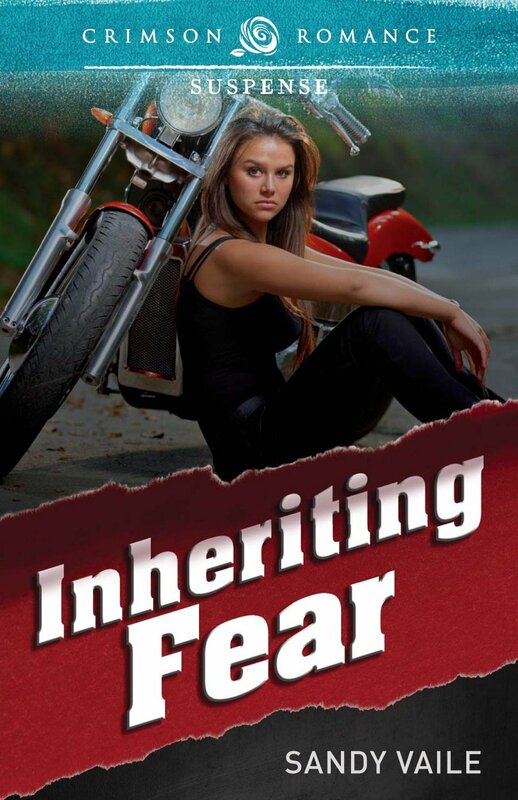 Leave a comment for a chance to win a copy of Inheriting Fear in eBook format. What struggles have you overcome? Was very shy and introverted when I was little. I used to hide under my mom's skirt rather than face anyone. As I got older, I began to emerge from my shell somewhat although I'd never say boo to anyone, hated confrontation of any kind. It wasn't until I got into my thirties that I began to speak up for myself. It hasn't been easy but I'm more confident now in my own abilities to do things and express myself. Good on you Debbie. We all have to struggle on a daily basis, but the will to persist is what gets us through and makes us stronger. Thanks for commenting. Congrats to Sandy on the new release! I've been fortunate to not have experienced a lot of hardships through my life. Got myself into a bit of financial trouble as a young 20 something, but that was cured with cutting up the credit cards and budgetting :) thanks for sharing! I think everyone can sympathise with credit card debt, Erin. Glad to hear you've got everything organised now. Thanks for commenting. Thanks for sharing, Joan. We lost a member of our family unexpectedly last year, so I can understand how difficult that was for you. Being shy and doing new things... I have done better over the years, but still hold back quite a bit. Thanks for sharing Sandy! Thank goodness the worst of my struggles seem to be behind me. Way too personal to share really. I can totally understand that, Mary. Glad to hear you are forging ahead, and I appreciate your comment. The biggest struggle I overcame was living on my own after a gazillion years of marriage and raising 7 kids. Wow, I can't begin to imagine how difficult that would be. It would take a lot of courage and determination. You are my hero! Best of luck for the competition.